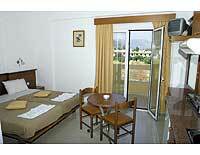 Danelis Hotel Apartments are to be found on the north coast of Crete, at the popular beach resort town of Malia, and is a friendly family-run complex. This compact resort benefits from having only 15 comfortable studios, a mix of 1 and 2-room studios for 2-4 people, more popular with young visitors enjoying the vibrant nightlife and buzzing social scene, although young families are welcome. The Danelis Hotel Apartments are well-maintained and well-run, and offer inviting pools for adults and children, sun terrace, cafeteria-bar and tavern and a mini-market. The Danelis hotel Apartments are an ideal affordable base for a fun holiday on Crete, only a short walk to the main strip, yet away from the urban bustle as a quiet haven.